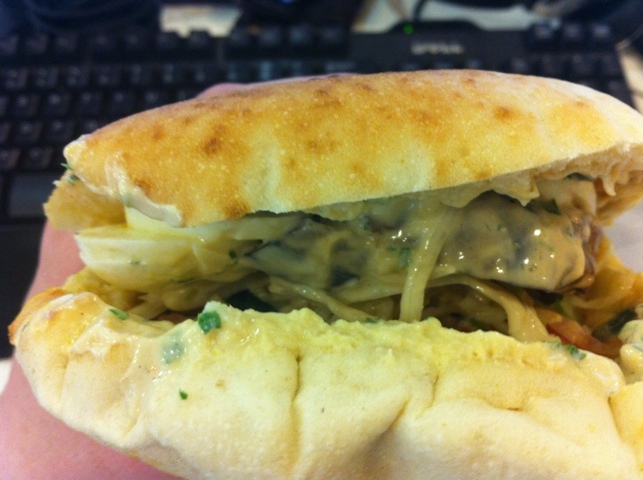 Reading around the foodie blogosphere I learned of a mysterious dish served up at the excellent Taim Mobile truck, something called a “sabich.” Recently I had the chance to try it. 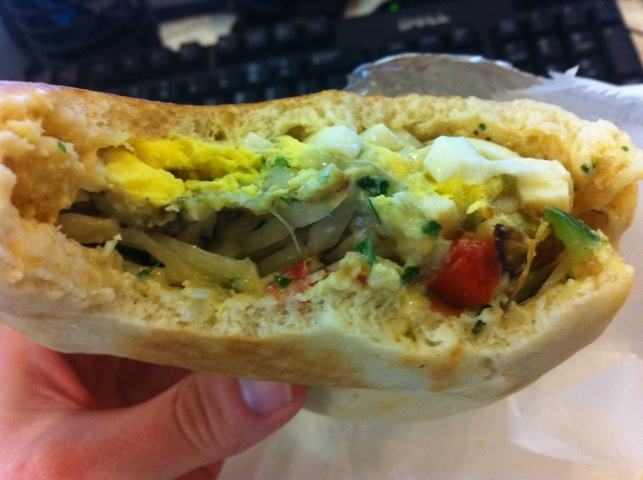 Well, a sabich sandwich involves thinly sliced fried eggplant and a boiled egg on a white pita. The sandwich itself clocks in at $6.75, with the larger platter formation (to include hummus and more) for $11. 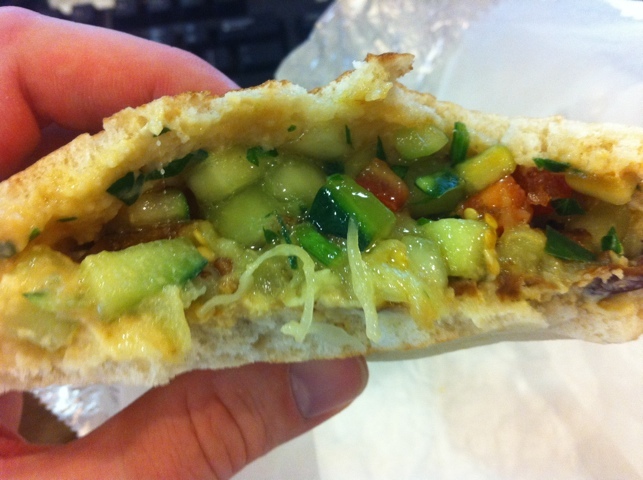 The thing about sandwiches put in pitas is that they inevitably face construction issues. The ingredients must be stacked atop each other, and therefore there’s no way to get a mouthful with all the varieties of flavors together in it. 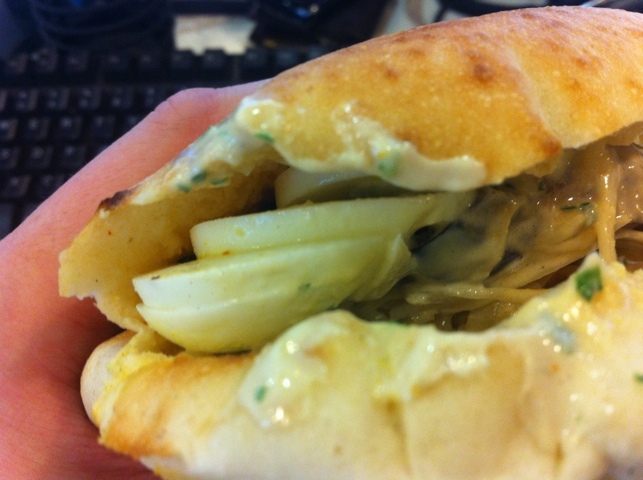 In this case, the boiled egg was bunched together in the top corner of the sandwich. So what you have here is an initial flavor (not surprisingly at all) of egg salad, and it is most welcome. There is a particularly pleasant faint mustard note to it. Beneath the slices of egg are thinly sliced, lightly fried medallions of eggplant. They have virtually no texture upon the bite, liquifying nearly instantly. In fact, the sensation is gratifying. On balance, the overall sandwich is flavorful, satisfying, different, and lovely. The construction plays a significant issue. As a result, the chopped salad wound up on the bottom of the thing, like a separate course. So it’s a two-course sandwich: egg salad, then actual salad. ← Big D’s Grub Is Excellent. Really Excellent. Among The Best Truck Fare.